1. Do NOT panic. Let me say that again. Do NOT panic! Although it is difficult because of your emotional involvement, you must be careful not to go into full parent mode. As we all know, this immediately puts your child into child mode. All parents know that child mode is far stronger and more frustrating than parent mode. 2. You will not get a lot of help from your child. If you see something problematic on the report, be prepared to hear your child refute every single aspect of anything negative. You will hear things such as, “She is the worst teacher; ask anybody.” Or, “I don’t know what Mr. Smith is talking about. I did every homework assignment this quarter.” Students seem to have no idea how they are doing in a class until these reports surface. 3. Contact the teacher. You must call or email each teacher individually and allow a few days for your return call. But you should not have to wait more than a few days. Depending on grade level, you can call the department chairperson, guidance counselor, or appropriate assistant principal. Do not call anyone before you try to reach the teacher first. This is not only courteous, but professional as well. 5. Set up a plan to move forward. There is a triangle that’s needed to work together for the benefit of the child. You need the school, the parent, and the child. If any one of these is missing, it’s difficult to improve the situation. Too many parents talk to the teacher when the child is not present. This is a HUGE error. The student has to do the work and implement the changes. Too often parents make deals with teachers that the students simply can’t honor. 6. Your child must make arrangements for extra help. Whether it be lunch time or after school, extra help serves two very important functions. First of all, the student will get more personalized attention. Secondly, the teacher truly appreciates the efforts of a student who puts in that extra time. 7. More drastic measures are often needed. If the student has not done his or her homework. Instead of taking things “away”, add things to reward good work habits. If I child usually gets 30 minutes for Playstation, he should now get 45 minutes after all homework is completed. This creates a win-win situation in the household. 8. Outside help might be needed. Although I own a tutoring agency, I don’t think parents should use outside help until all other alternatives have been exhausted. Some teacher don’t know how to reach certain children and often personalities do clash. There are many outside agencies that offer tutoring and even educational testing. It is best to find these people from referrals whenever possible. 9. Daily progress sheets. In more drastic situations, these are sheets that each teacher must sign daily to indicate how your child is doing. This will give you an immediate idea of how well the new plan is working. 10. DO not wait for the next progress sheet/report card. 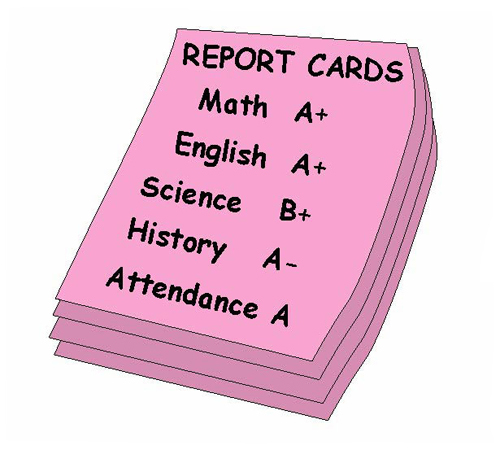 The first report card is usually mailed home 10 weeks into the school year. You need to be in contact with certain teachers sooner. One quarter of missed work is very difficult for an already struggling student to make up.